Actress Raven-Symoné attends the premiere of Fox’s Empire at ArcLight Cinemas Cinerama Dome Jan. 6, 2015, in Hollywood, Calif.
Last week Rodner Figueroa was fired by Univision after making an on-air joke comparing Michelle Obama to an ape from Planet of the Apes. Soon after his firing, Figueroa issued a sort-of apology to the first lady and said that he’s not racist. “I want to clarify that I’m not racist and in no way was my comment directed at you, but rather the work of the [makeup] artist, which left much to be desired,” he said in an open letter to Obama. “I’ve been an activist for causes in favor of minorities, as I have been discriminated against,” Figueroa wrote, saying that one of his parents is black and noting that he is also gay. 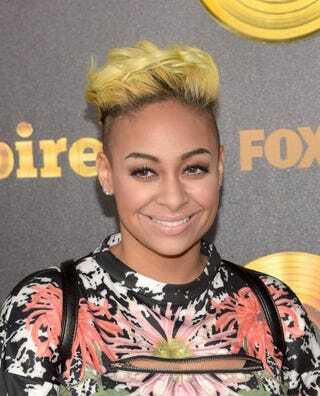 It seems that Figueroa has an ally in the controversy, in the form of actress Raven-Symoné. Symoné was a recent guest host on The View, and co-host Whoopi Goldberg brought up the firing (conversation starts at the 8:00 mark in the video below). Rosie Perez broke it down on how some Latinos are actually racist, even though some have African roots. “There is a secret in the Latin community, specifically the Caribbean, South American, Central American Latin community. They are very racist. They never want to be in the same group as black people. And he did say Michelle Obama looked like a cast member of the Planet of the Apes,” Perez said. Then Symoné chimed in. “But was he saying it racist-like? Because he said he voted for her later. And I don’t think he was saying it racist,” she said. “Oh, I’m not racist. I have black friends,” Perez replied sarcastically. Perez insisted that the comment was racist and that racism is a problem in the Latin community. That should have ended the segment, but Symoné decided to chime in again. “Not Michelle Obama. Michelle, don’t fire me from this right now, but some people do look like animals,” Symoné joked. “So can I be mad if someone called me Toucan Sam?” Symoné said. What part of Perez’s “that’s racist” did Symoné not understand? No one compared the first lady to a cute, colorful bird. Figueroa compared her to a primate, something that black people have been compared to forever. It’s never OK to compare a black person to a primate. Ever. End of story. Someone please inform Raven-Symoné of that, since it didn’t sink into her head when Perez attempted to get her to see it.